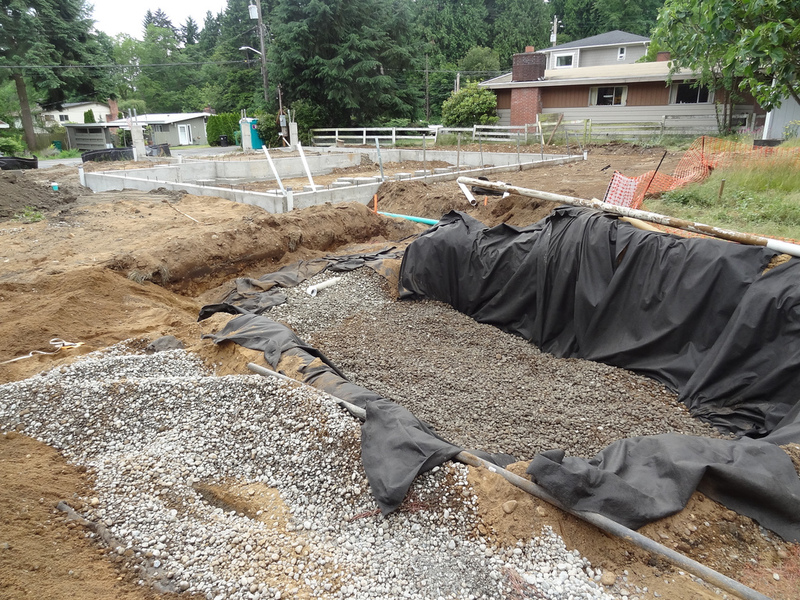 Rainwater management is an important aspect in modern home construction. While not a new concept (our last house was built in 1948 and had an underground infiltration trench), it is now required by code in some areas. Your lot conditions will have a huge impact on the design and ultimately how you experience your home. Any structure or non-permeable surface creates a barrier against rainfall penetrating the soil. In an area where 50% of the dirt is covered up, the remaining soil must absorb twice the amount of water as before. This can lead to erosion, runoff to adjacent properties, increased sewer usage, and pollution spread from things like pesticides and driveway oil. Detention and infiltration systems are designed to mitigate these problems. The basic concept is that all water that falls on a particular parcel is captured and drawn down into the local water table, filtering through the soil as it goes. There are many ways to achieve these results, but I’m going to focus on two of the most common approaches: rain gardens and infiltration trenches. A rain garden is a mulched bed which contains specially picked plants that thrive in an area that occasionally fills up with water. The soil beneath the mulch is a highly permeable mixture. The absorbency of the soil below combined with the capacity of the garden bowl above is designed to detain the rainwater as it infiltrates to the soil below. 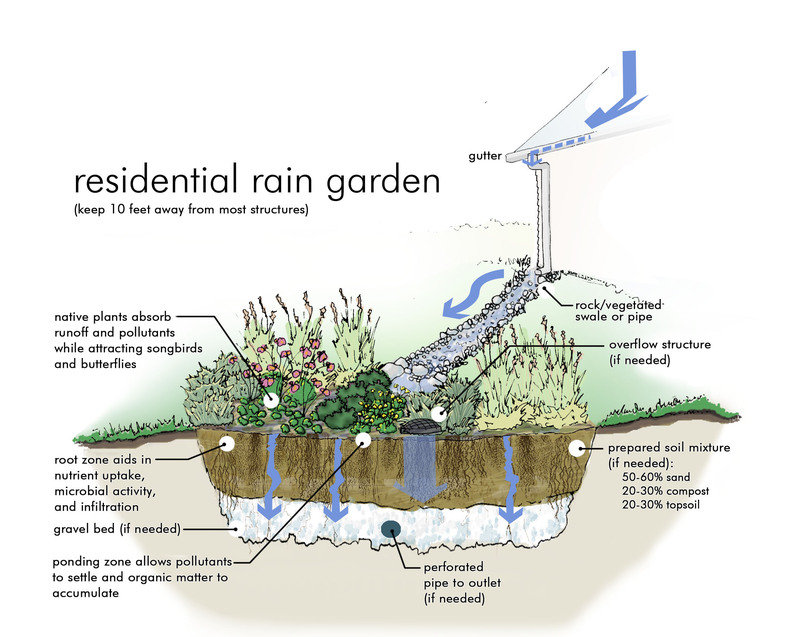 A residential rain garden is typically a pond-style design featuring native water plants. A small garden in a Seattle new construction home (pictured at top) shows a bit of rain collection and the freshly planted garden plants. In the middle of the garden is a plastic pipe through which all of the gutter water flows into the garden. Over the course of several hours, the garden should soak up all of the water. If all goes according to plan, none of it will spill out the front of the sloped retention area. The garden pictured to the right is a swale style where the basin is sloped from one end to the other and small gravel barriers have been placed to force the water to collect and zig-zag as it travels. This reduces erosion within the garden and gives the water more time to soak in. This variety is common in parking lots of malls and shopping centers. Rain gardens are required to remain in open air. You cannot fill it with rocks and cover it up or build a deck over it. If built to code, a rain garden in a city which gets several inches of rain per year can get very large. 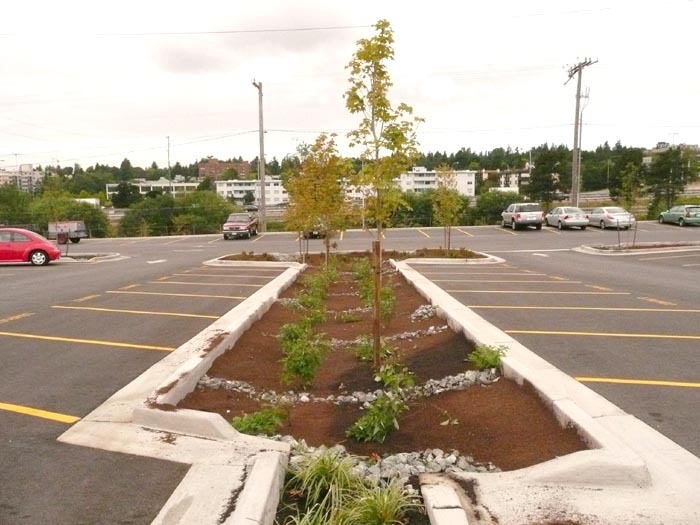 In the Seattle area, a rain garden should cover 15% of the contributing surface area. A house that has a footprint of 2,025 sqft (45′ x 45′) plus a driveway that is another 400 sqft (20′ x 20′) would require a rain garden that is approximately 15′ by 25′. That’s a lot of yard to give up, especially when new construction gets as close to the lot lines as possible. If your soil “percs” quickly at a deep enough level, you may be able to partially or fully submerge the rainwater management system. Perc is simply jargon for the soil drainage rate. A loose, sandy soil will drain quickly, while a clayey soil will resist absorbing liquids. Some early digging showed that we have what Earth sciences folk would call sandy loam. This is close to ideal for soil drainage, but you need to ensure that the conditions go deep enough to suit your needs. The picture on the right is a surface trench I found in the city of Lake Forest Park on by a nearly-complete spec home. 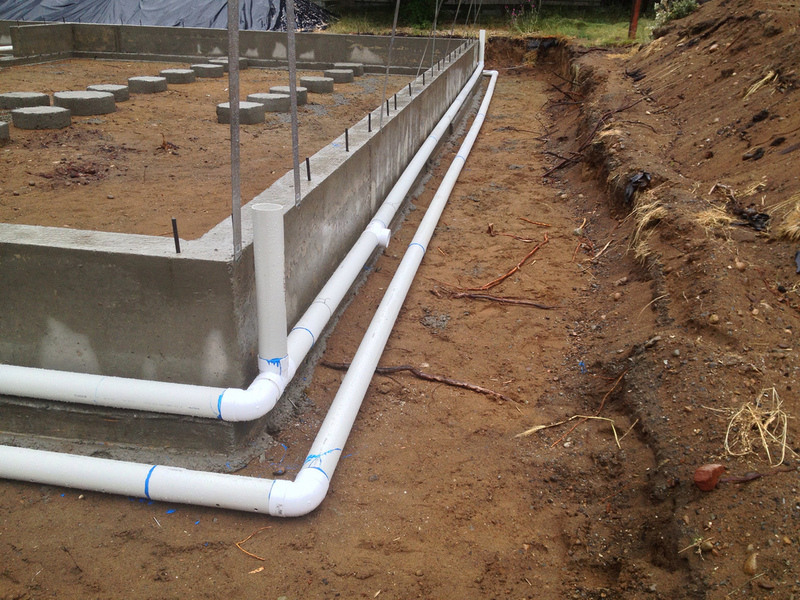 This trench is designed to receive the runoff from the gutters through PVC pipes but also to catch surface runoff as it drains downhill towards the back of the lot. Our goal was to have a fully-submerged infiltration trench. If we could show that the soil drained quickly at the right depth, we could build a highly effective, yet hidden solution to the runoff problem. Our perc test called for two six foot deep post-holes on opposite sides of the lot. Water was poured up to a certain depth and it was checked every few minutes to determine how quickly it drained. In two test locations on our lot, the soil drained extremely quickly, indicating an ideal scenario for a fully-submerged infiltration trench. The excavator was so fast that I hardly had the time to take photos. Had he not dug it in the wrong place at first, they would have had it filled and covered in a single day. The pit differs from a rain garden in that it is lined with drainage cloth, filled with rock, covered with another layer of cloth, and then buried beneath topsoil. The results are the same, but there is almost no visual indication that the system exists. The biggest clue about the location of the pit is a small cleanout grate in the back yard. The gutter drain pipes connect to a small cistern before heading to the rock pit. In exchange for getting all of this extra usable yard space back, we must shop-vac out the cistern every six months or so. This is a worthwhile tradeoff that I would take any day. 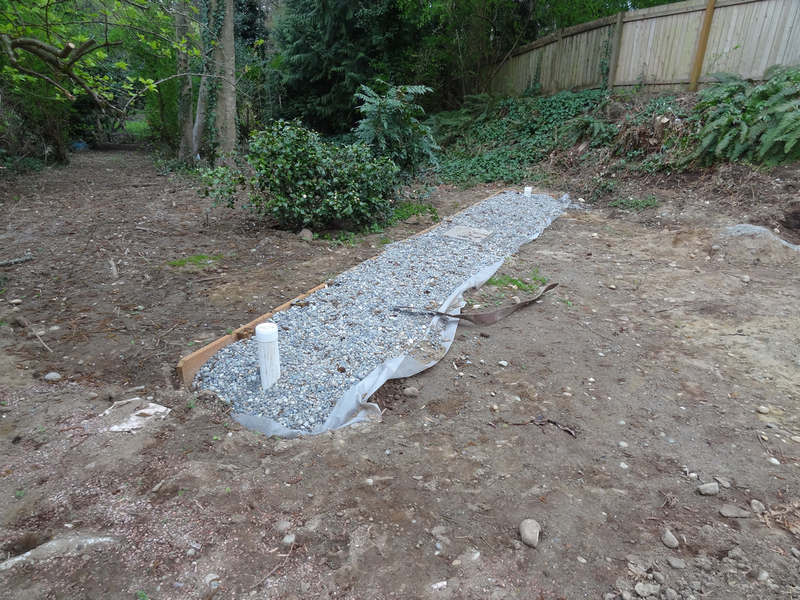 This entry was posted in Preparation, TMYK and tagged design, excavation, footing, foundation, progress, rain gardens. Bookmark the permalink.